Dr Jengo's World: Second Secret Pirate figure from McFarlane Assassin's Creed Revealed? 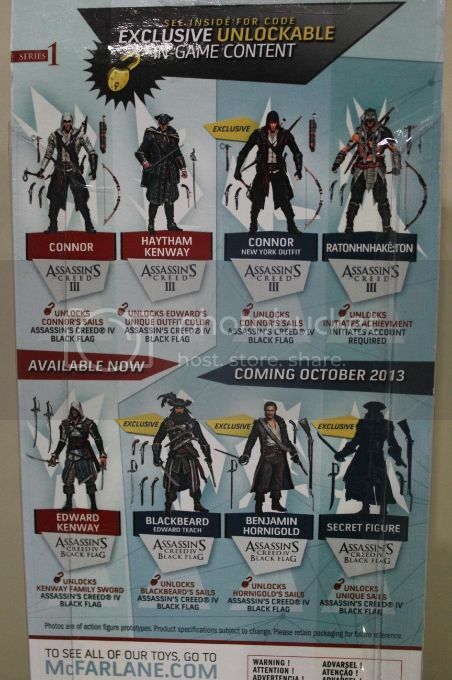 Second Secret Pirate figure from McFarlane Assassin's Creed Revealed? So you guys saw my pics of the first 3 figures from McFarlane's Assassin's Creed series? What are your thoughts? Cool? Too small? Lousy? Awesome? Let me know in the comments below.. Anyway, went looking for more info on when the next figures are coming out and I managed to find out who the second secret pirate figure is? McFarlane had been keeping it under wraps till now but it has been leaked. ToysOnFire, a Canadian retailer, has this listing of Black Bart up on their site. Check out the link. No pic as of yet though. It was predicted by many that Black Bart would be the second secret figure and looks like they were right. So it looks like Black Bart and Benjamin Hornigold will be the pirates joining Capt BlackBeard in the 3-figure pirate pack. We also know that Black Bart and Benjamin Hornigold will be available as separate figures while Capt BlackBeard will be exclusive to the 3-pack. ToysOnFire also has the exclusive Connor in his New York outfit variant figure. Pretty cool! Do let me know where else I can get the Connor (New York outfit) figure as I would like to get that too.